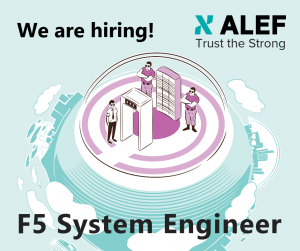 In our team we are currently looking for a F5 System Engineer. We are looking for a highly motivated self-starter, responsible for overall F5 technologies. System support and implementation of technical cases for partners, implementation of EC (Expert Center) services mainly in the area of security. Understanding the needs of customers and ensuring technical cooperation with the sales department, working with the team leader. Professional support at all stages of the technical case or service of the Expert Center (EC) - support of the current business situation, analysis and definition of demand and cooperation with the business team to solve it, identification of other business opportunities. A psychically strong and mature personality with a leading talent that considers stress as a natural part of achieving challenging goals. High degree of personal courage and motivation to succeed. Higher education, technical direction advantage. Experience with training, work on projects, consultations, service activities, etc. Ability to work independently and teamwork. Ability to work with high engagement and bring projects to the final state.